The stomach is responsible for providing the entire system with energy. It handles the digestion of food and fluids and is commonly called the “Minister of the Mill” and the “Sea of Nourishment”. The stomach digests the foods and fluids and moves them to the small intestine. The stomach also extracts energy from foods and fluids and in conjunction with the spleen, eventually transporting this energy though the entire body, including the meridian system, and finally to the lungs, where it is expelled in the breathing. The stomach Meridian, and its sister Meridian the Spleen, are both Earth Meridians. The peak energy time for these meridian is 7-9 am. This treatment protocol is focused on 4 Stomach (St) Meridian points. St2 – located just below the orbit of the eye towards the nose, near the large facial vein. This point relaxes muscles, tendons and the overall body. It also promotes drainage of the maxillary sinuses and is another site that may be used in patients with facial paralysis. Treat for all eye problems and gastrointestinal upsets, including Colic. St25 – is located 2—3 cun lateral to the navel. This point is the alarm point for the large intestine, and is used to treat all gastrointestinal disorders such as colic or diarrhea. ST36 – is located lateral to the curvature of the shin, about 6” below the stifle slightly distal to the tibiofibular articulation. This is one of the seven master points of the body. It is known as “Leg Three Miles” and controls the upper abdomen and energy. It is thought to be the major body point for systemic tonification. Stimulation of this point relieves upper abdomen and digestive system issues, pain, arthritis and paralysis of the lower hind limb, fever, lethargy, and controls the entire autonomic nervous system. ST45 – Is located on the lateral aspect of the hind foot coronary band. 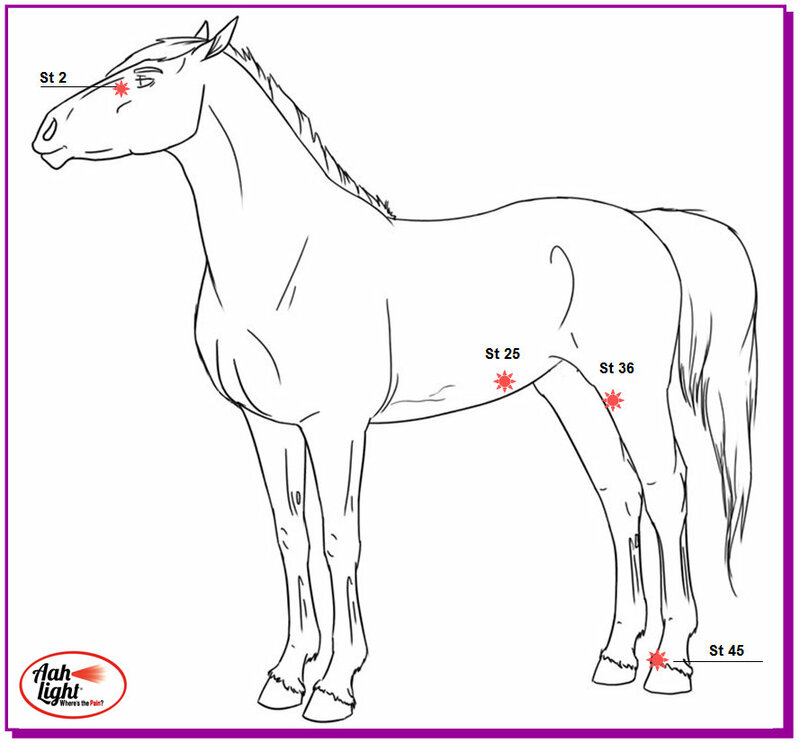 This is a ting point and when stimulated helps relieve laminitis, ringbone, navicular disease, all hoof problems, convulsions, and colic. AAH Light is an Amazing healing tool! To see the packages available for your Equine, Feline, Canine or personal use, click the button below.